This is the amazing biography of the Canadian electrical experimenter John Hutchison written by a scientist and licensed professional engineer who worked closely with Hutchison. The author personally witnessed some of the strange phenomena associated with John and his apparatus. Based on correspondence with John, this book shows what underlies The Hutchison Effect and why conventional physics explanations of the phenomena are inadequate. Electrical circuit diagrams and color plates never before seen detail the apparatus John used to make objects fly about in his laboratory, fracture in unusual ways, and create other startling effects. A fascinating book about the strange high voltage Tesla energy blasts that Hutchinson used to levitate objects and even fuse two different metals together such as an aluminum block and a steel butter knife. The only book about the mysterious Hutchison Effect and his “crystal energy cells.” Lots of photos and diagrams. 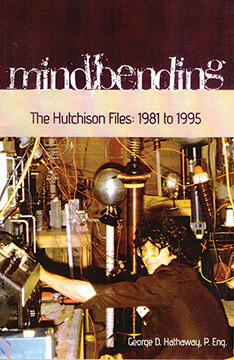 MINDBENDING: THE HUTCHISON FILES: The Biography of John Hutchison By George Hathaway, P.E. 128 Pages. 6x9 Paperback. Illustrated. Index.